This session takes place on Sundays and is aimed at children who can swim between 50 metres and 800 metres and who are confident in the main pool. Swim Development members can enter the Club Championships and Founders Galas, if they meet the age and swimming distance criteria. Sessions are arranged over 12 - 14 week terms. Fees are paid a term at a time. 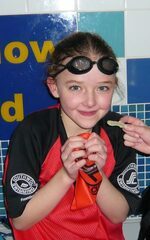 Swim Development swimmers must purchase a set of training fins (NOT flippers) so that they can start to learn correct stroke technique and the drills required to develop their stamina and technique. 100m => 400m Can do Bronze.